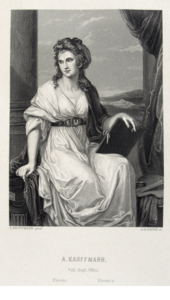 The exhibition catalog presents the collection of a private collection with more than 100 engravings after the most famous works of Angelica Kauffman. The catalogue has been edited with much knowledge by Kauffman expert Bettina Baumgärtel and gives an insight into the heyday of English reproductive prints. A second chapter is dedicated to the portrait of Johann Joachim Winckelmann and his reception. For the first time, Baumgärtel gives a comprehensive overview of the different versions of the famous portrait, which was vividly copied in numerous prints and reproductions from the 18th to the 20th century. The AKRP team congratulates Alex Kidson on the publication of his excellent catalog raisonné of works by George Romney (1734-1802), a painter colleague of Angelica Kauffman, who mainly worked as a portraitist in London. After twenty years of intensive and painstaking research, Alex Kidson released the three volumes of more than 1800 catalog entries in 2015.